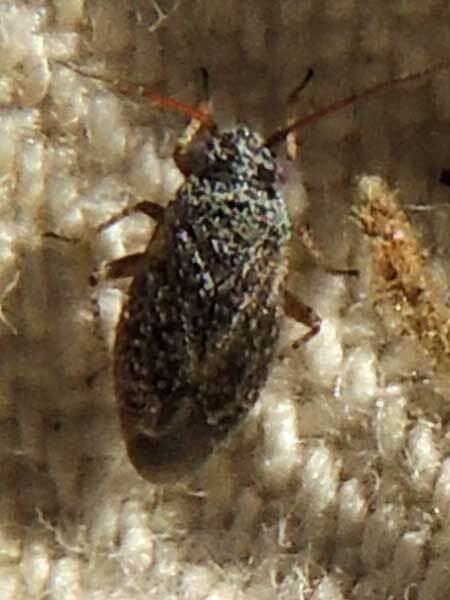 Many of these active bugs were found on Lycium fremontii. Palo Verde, Maricopa Co., Arizona. Feb. 2nd, 2014. Length is about 3 mm. Also called jumping tree bugs because these bugs can jump well with their strong third pair of legs. Hundreds of species are likely to be encountered in the Sonoran Desert. Most are rather specific as to the kinds of plants they prefer. Feeding is by piercing-sucking mouthparts and is concentrated on flowering buds and fruits when present. When sitting on their preferred host plant they are nearly invisible because of their cryptic colors and patterns. Often it is necessary to knock the plant over a white cloth in order to find them. Birds, such as verdins and Black-tailed Gnatcatchers, with their very keen vision can nonetheless spot them and sometimes catch them. Many of these bugs inhabited every Fremont Thornbush at a spot in western Maricopa County, Arizona. Copyright Michael J. Plagens, page created 10 February 2014.